Snacks, not appetizers, imply treats that can be made ahead, stored and pulled out when you have an urge to munch, like while watching your favorite TV program. A snack can be eaten at any time. Make or buy gourmet snacks to have on hand for yourself or whenever unexpected company drops by. 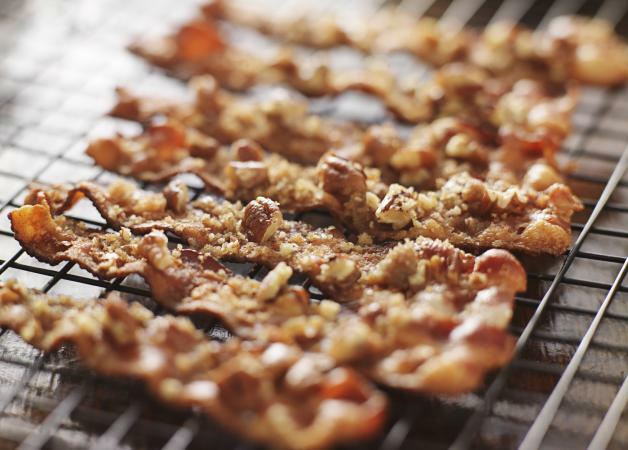 While the name might be a little offputting, what's not to love about candied bacon drenched in brown sugar and pecans? These can be stored, tightly covered, in the refrigerator. Heat oven to 350 degrees. Line a jellyroll pan with foil to catch drips. Place an ovenproof rack on the jellyroll pan and set aside. In a zip-top plastic bag, place dark-brown sugar, dry mustard, and optional chili powder or cayenne pepper. Seal and shake well until mixed. In batches, toss in a few strips of bacon at a time and coat them with mixture. Lay the coated bacon strips on the rack. Repeat until all strips are coated. Add chopped pecans to remaining coating mixture and shake to cover the nuts. Sprinkle coated pecans evenly on strips of bacon on the rack. Bake for about 30 to 45 minutes or until cooked through. Watch carefully because dark brown sugar has more molasses than light brown sugar and can burn. Cool on the rack until stiff. Transfer to paper towels to drain. Store covered and refrigerated in a single layer in a rectangular container with waxed paper between the layers for 3 to 4 days, or freeze. The bacon will soften with refrigeration so you might want to re-crisp it in a 350-degree oven for 5 minutes when serving. Who would have thought frying small pasta shapes and coating them with exotic spices, herbs and cheese would make a great snack? But they do. Make them ahead, topped to your liking, store tightly covered, and pull them out when the urge strikes. In a small bowl, combine lemon zest, Parmesan, optional chives or parsley, optional thyme or basil, and paprika. Set aside. Bring a 4-quart saucepan of lightly salted water to a boil. Add the pasta and cook halfway, about 7 minutes. Drain pasta thoroughly and blot dry. In a fryer or deep heavy-bottomed saucepan set over medium-high heat, heat oil to 375 degrees. Fry pasta in four batches until light brown, about 1 1/2 minutes. Remove from oil using a wire skimmer or slotted spoon. Drain on a paper towels. Repeat with remaining batches. While pasta is still warm, sprinkle each batch with 1/4 of the cheese mixture. Season with salt and pepper. Store covered in an airtight container up to three days. 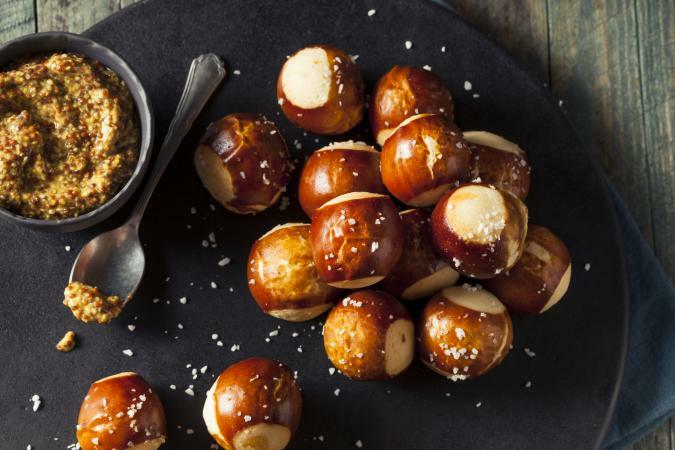 If super crunchy isn't your idea of a good snack, these soft pretzel bites are just the ticket. Dip them in the gourmet mustard of your choice. This pretzel recipe is a bit of work because it's made the authentic way by boiling and baking, but they taste oh-so-much better than the bagged variety. In the bowl of a stand mixer or a large bowl, stir together warm water, sugar, and salt. Sprinkle yeast on top of liquid and let sit for 5 minutes, or until the mixture is bubbly. Using the dough hook and on low speed, start adding flour and melted butter, alternately, until the dough comes together into a shaggy mass. Increase the mixer speed to medium and knead until dough is smooth and pulls away from the bowl, about 4 to 5 minutes. Remove the dough from the mixer and transfer to a bowl coated with nonstick cooking spray. Cover with plastic wrap and let rise until doubled, about 1 hour. Heat oven to 450 degrees F. Line two large baking sheet pans with parchment paper and lightly coat with nonstick cooking spray. Set aside. In a large pot, bring 10 cups water and baking soda to a rolling boil over high heat. While the water is heating, turn the risen dough out onto a lightly floured work surface and divide into 8 pieces. Roll each of the 8 pieces of dough into a smooth, 12-inch rope. Cut each rope into 8 equal pieces and lay them on the parchment-lined and sprayed sheet pans. When the water has a reached a full rolling boil, slip the pretzel pieces one by one into the pot and cook for 30 seconds, flipping halfway through. Using a slotted spoon, remove from the water. Return the boiled pretzel bites to the parchment-lined and sprayed sheet pans in a single layer. Brush the top of each with the egg yolk-water mixture, and sprinkle with the salt. Bake until pieces are dark golden brown, about 12 to 14 minutes. After cooling on a wire rack for 5 minutes, serve with the gourmet mustard of your choosing. Cool completely before storing in an airtight container for up to 3 days, refrigerated. Reheat in a microwave before serving. What's so gourmet about trail mix? Well, when it contains dried tropical fruits and nuts like macadamias and cashews, the ante is upped. 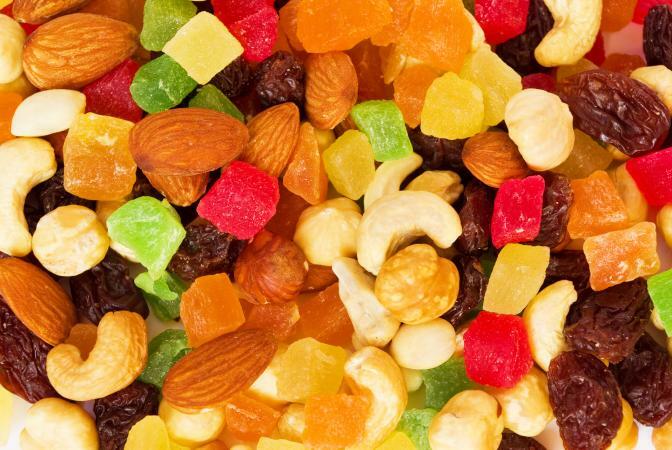 All the dried fruits, except the cherries and coconuts, are unsweetened. If you like a sweeter flavor, by all means use sweetened dried fruit. Place pineapple, mango, kiwi and cherries in a large bowl. Add cashews or nuts of choice, optional coconut and sesame sticks, and toss to combine. Store in an airtight container at room temperature. Dried fruit has a tendency to stick together so just shake the container before serving. Bacon Jam: That's right - spreadable bacon. Bacon in any form continues to be trendy. The folks at Bacon Jams sells this sinfully delicious concoction in original, black pepper, and red chile and garlic variations for around $15 both online and at select stores. 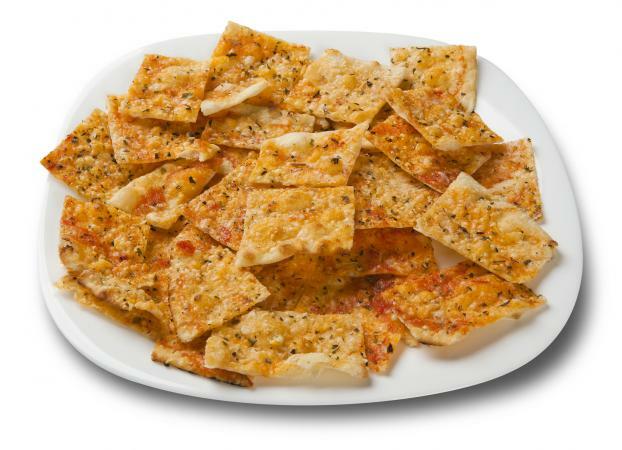 Spread it on your favorite gourmet cracker or bread. Beet and Red Onion Marmalade: This savory pairing of beets and red onion from Wildly Delicious retails for about $8 and is perfect as a dip with bread sticks or crostini, but also as a condiment for sausages and burgers. It won the 2013 SOFI Gold Award for Outstanding Jam, Preserve, Honey or Nut Butter. Savory Popcorn: The Popcorn Factory has taken popcorn out of the cinema and into your well-appointed living room with savory flavors that include white cheddar, buffalo ranch, mesquite, BBQ cracked pepper, sea salt and more. Each of the seven flavors retails for around $10 and is available online. Reviews on the company website call it both "amazing" and "delectable." Marcona Almonds: These imported Spanish almonds are not like the almonds you grew up with. They are rounder and plumper and seem to have a softer texture, somewhat like macadamia nuts. Hot Paella sells a 17.6-ounce package for $24. Reviews on Amazon note that the almonds are "fantastic" and "expensive but worth it." Castelvetrano Imported Green Olives: Foodies in the know are fawning all over these bright green Italian olives with a crisp, meaty texture and a flavor that can be described as mild, buttery and nutty, complementing most dishes, wines and cheese. Mezzetta sells them for around $7 online and at select grocers. These snacks all pair well with wines, craft beers and retro cocktails. So, if you've invited friends in for Game of Thrones and snacks, don't forget the beverages. These days, pretty much anything goes but, if you're a stickler, take advantage of recommendations from a food and wine pairing chart and a rundown on popular beers.